In upcoming Facebook algorithm changes, page posts that generate conversation between people will show higher in News Feed. Why is Facebook implementing this change? Because our news feeds are INUNDATED with “click-baity” (is that a word?) posts from businesses, brands and pages I “liked” years ago that have since changed ownership and content messaging. Can you tell I feel strongly about this topic? I know that personally, I’ve been avoiding Facebook because my entire news feed is filled with partisan “fake news” (see figure 1) and quotes that are actually videos designed to look like pictures (see figure 2) because videos perform better under the current algorithm. As an end user, I’m looking forward to seeing what this change truly means for our news feeds. For businesses and brands, this means they will need to rework their content strategy for Facebook. With all algorithm changes come metrics changes. Knowing the best ways to to measure the impact of your content, such as knowing your audience, will ensure metrics like engagement don’t drastically drop. Zuckerberg makes it clear that using “engagement-bait” (Figure 3) to goad people into commenting on posts is not a meaningful interaction, and Facebook will demote these posts in News Feed. This means brands will need to reevaluate the their content strategy-what the content is, the mode in which it is shared, and how users will be able to interact with it. About a year ago, Facebook tweaked its algorithm to show live video broadcasts higher up in people’s news feeds. Mark Zuckerberg states that he has “seen people interact way more around live videos than regular ones,” and with this knowledge, it’s no secret live video will be integral to getting content disseminated to target audiences. When I started blogging on this platform, I had no prior experience creating my own website/blog. With the WordPress platform, I could pick a theme, customize it, and publish my first blog post within a relatively short amount of time. Coming to WordPress with a very basic amount of website management knowledge, I felt confident in navigating the platform with no previous ideas of what it was or how it worked. Additionally, the SEO functionality of WordPress seems to be top notch. Although the SEO of this blog was never my main focus, WordPress has tons of SEO plugins that enable users to optimize content, meta tags, keyword focus, and more. Again, the usability of this SEO tools make WordPress a proven leader in content management systems. Updating my dog blog hosted on WordPress is the bane of my existence. -Barack Obama, probably. Every great human/thing/platform has its fair share of problems. For WordPress, the never-ending updates always get me. I understand the need for updates on themes, plugins, etc., but I don’t understand how there are always so many so often. I hear there’s a plugin that allows you the ability to set updates to automatically update in the background, so maybe that’s worth a try. In regards to the scalability of WordPress, I believe it can be utilized for both small blogs and large enterprises. Because WordPress is a very popular, open source platform, there’s a possibility it may be more vulnerable to security attacks. If an enterprise wants to use WordPress, just like with any other CMS, it must to take proper security precautions that ensures the security of their site. Looking back on this semester, I’ve learned SO much. From the impact the digital divide has had on our globe to the history of advertising, digital communications has become ingrained into everything we do. One topic in particular we discussed that has resonated with me on a different level is the evolution of social media and how it has substantially changed user behaviors (especially my own). I used to manage social media as part of my career, and even then, I still didn’t fully grasp the impact it has had and will have on our society. My first social media platform of choice was MySpace — it’s the platform where I learned what HTML code was and how I needed to adjust it to change the colors of my background; the platform where bulletins were the first exposure I had to blogging. I’d come home from school, log-on to my desktop computer, and hope I had notifications from friends commenting on my pictures and new profile song. If you told 6th grade Madeline that MySpace would fizzle out and Facebook would take over, I never would have believed you. But here we are now, in 2017, and I’m getting Facebook notifications on my Apple Watch even though my phone and computer are right in front of me. It’s very clear that social media isn’t going anywhere, and millions of dollars are being spent to develop the next big thing: the next update, the next UX, the next messaging platform. Just the technological convergence I’ve witnessed in my lifetime is overwhelming — I’ve got a camera, phone, GPS, heart rate monitor, remote control, and music player sitting in a one inch by one inch supercomputer on my wrist. 10 years from now, I’m sure I’ll be thinking how ridiculous it was that I had to physically use my fingers to text people in order to communicate with them. How much farther can we possibly go? Social media is more than a fad — it’s a present and powerful force has the power to change the way we think about the world, other people, and our own self. As updates come along and new platforms and technologies are introduced, my hope for myself is that I’ll be able to use these technologies and benefit from them, but never let them take me away from living in the present. David McCandless, a data journalist I’ve been following for years after I StumbledUpon his website, is a pro at visualizing information – facts, data, ideas, issues, statistics, questions – in graphical ways anyone can understand. He’s the mastermind behind Information is Beautiful, a website that uses graphics & visualisations on facts & data to tell stories – and he does this with strategy and grace. This data tells a story without saying more than a few words — how much streaming apps pay the music industry and how the size and popularity of a service impacts the likelihood of musicians earning a living from it. David created this infographic based on credible data and revealed connections, patterns and the stories hidden underneath the numbers. Data journalism allows us to tell complex stories through engaging infographics, making the most difficult of concepts easily understood by a wide audience. It also can be thought of as using data to find a story that isn’t visible on the surface. The future is bright — it’s already become a prominent category in the world of journalism, and as more people read and request it, the bigger the spotlight will be. Quartz describes data journalism as “exciting – it can elevate our knowledge, enliven statistics, and make us all more numerate.” It’s a great way to double check things we think may be true, but don’t have the sources to back it up. But, just because a story or infographic is based on data, doesn’t mean it shouldn’t be analyzed through a critical process lens. It’s very possible data can only highlight a single perspective, thereby restricting the stories that are created with it. It can contain inherent bias, and could easily fall into the “opinion” category of journalism as well. Data is also always changing, so it’s important to ensure the data used is up-to-date. As with all journalistic pieces, it’s vital that we accept nothing at face value and always dig a little deeper to find credible takeaways. Even the best of journalism that’s 100% based on data is subject to human error and bias. Diversity makes us smarter — it fosters innovation and competition, it makes us creative and hard-working, and it forces us to look at things differently. With all of this in mind, it seems that encouraging diversity should be a easy, right? In the United States, the “melting-pot” of the world, white males own about 75% of full-power commercial TV stations. The Telecommunications Act of 1996 made it a whole lot easier for the biggest media companies to merge, and with giant mergers like NBC and Comcast, media ownership by females and minorities have significantly dwindled. For example, with a lack of restrictions that limit mergers and ownership limits, media groups can own upwards of thousands of radio stations. The U.S. is made of roughly 50% of females, and a disappointing 6.5 percent of females own full power commercial TV stations and FM radio stations. The numbers don’t match. Start in the heart of the company. Hire diverse editors, executives, and employees, because all media begins through the lived experiences of those who share it. Encompass all aspects of diversity — going beyond race and gender and looking at economic, geographic and social backgrounds ensure true diversity. Enact government regulations. Nobody likes when the government steps in to regulate, but when mergers happen and and monopolies appear, we lose diversity and lack of choice for consumers. Peter Cvjetanovic was doxxed. Was it ethical? Did he deserve it? Doxxing – the act sharing someone’s personal information online in the name of social justice . Someone saw this photo taken at the rally and somehow knew the star of the photo. A Twitter account,”Yes, You’re Racist,” relied on crowdsourcing to identify the marchers at the protests as neo-nazis and racists, and those identified, like Cvjetanovic, have been heavily targeted. People are calling for him to be expelled from UNR for identifying as a white nationalist and promoting racist rhetoric at the rally, and they don’t feel bad about it. But is it ethical to use the tool of doxxing for “social good”? Many times, people aren’t posting private information . Cvjetanovic was attending a public rally without hiding his identity – someone just happened to post a picture of him that went viral. Others argue that doxxing is digital release of private information without their consent, and therefore, can’t possibly be ethical. Theoretically, Pete Tefft (above) could have been protesting this rally and not involved in perpetuating the hateful rhetoric at all – there’s only so much we can get out of this picture. But if he really was spewing hatred at the rally, does he still deserve to get fired from his job for exercising his right to free (but hateful) speech? I’m not sure where I stand on this one, but I won’t deny that I was a little giddy when I initially found @YesYoureRacist on Twitter. Last week, my cable/wifi/electricity went out for about an hour in the middle of a storm, and maybe I freaked out a little bit. My phone battery was on 4%, Netflix was down, and the work I planned on finishing up that night was put to a halt. It ended up being a relaxing evening as I finished off a novel surrounded by candles and a flashlight, but nevertheless, my nightly routine was severely impacted by the lack of (mostly) necessary resources. Major #firstworldproblems, am I right? As I’m addressing the topic of digital divide, I want to note that I am so privileged – I have mega fast internet at home, unlimited data from my cellular provider, a laptop and desktop computer, a tablet, a smartphone, and probably other gadgets I’m forgetting about. To those reading this – take just a second to acknowledge that you’re probably reading this on a smartphone or computer and you’ve got it good. Are smartphones addressing the problem? They allow us to access the internet practically anywhere, without being forced to subscribe to broadband internet (wifi) at home. In fact, 1/3 of American’s don’t even have high-speed internet access at home, so that means a good chunk of smartphone users depend on data from cellular providers or free wifi. Let’s look at a scenario where internet is necessary: applying for college. Most college applications, like The Common Application, are done entirely online. From researching potential colleges to writing application essays and saving them as PDFs, practically the entire process is done over the internet and on a computer. Personally, I usually have 5-10 tabs open at a time when completing projects – switching back and forth between tabs on a smartphone makes the process timely. How would I type a paper on a phone? Is that even a thing? If it was, where would I save it? Is it possible to submit proper documents on a smartphone like reference letters and transcripts? If it is, it probably isn’t easy. Are smartphones helping those without broadband at home get online? Yes. Are smartphones the answer to bridging the digital divide? No. Technology convergence isn’t narrowing the digital divide – let us remain vigilant in identifying and strategizing the best solutions that will. Incorporating social media into corporate and personal communication strategies can be a strategic investment. From delivering personalized customer service to building brand reputation and identity, social media empowers people to connect with their audience in ways that were once impossible. Another thing about social media – it’s always changing. Platforms are being added, subtracted and updated to better meet the needs of their consumers, and this makes it difficult for even the biggest of social enthusiasts to keep up with the latest and greatest. Cue Brian Solis, digital analyst who sought to share the digital transformation of social media through a handy infographic: The Conversation Prism. And just like social media is constantly evolving, the Conversation Prism has gone through multiple versions to keep up with the current landscape. The objective of the Conversation Prism is to help anyone better understand and engage with the current state of social media. The latest, Conversation Prism 5.0, has some distinguishable changes compared to its predecessor (4.1). YOU are always in the center: Let’s face it – it’s practically impossible to establish a meaningful presence on every single platform. That’s why it’s critical for you to establish what your main goals are in using social media. In both prisms, it always starts with you. Listen, Engage, Learn, and Co-Create are the newest and next best steps: Solis adjusted the pillars for meaningful engagement (vision, purpose, value, commitment and transparency) and redefined them in a broader, simpler way to digest. Goal Focused, not Business Focused: Rather than dividing the outer halo by businesses departments (HR, sales, etc. ), Solis adjusted the prism to help the viewers better understand the main functions of each platform. For example: Let’s say I want to listen to what the influencers are saying about video collaboration – according to the 5.0 prism, I should look at platforms to listen to what contributors on AllExperts or Quora are talking about regarding the latest video collaboration technologies. Some platforms are changing categories: While Pinterest fell into the Social Curation category in 4.0, it jumped to Social Commerce in 5.0 after the addition of the “Buyable Pins” feature. New platforms call for new categories: Connecting IRL wasn’t even a thing for 4.0 because apps like Tinder, Bumble and vina weren’t big yet. As new social platforms emerge, new categories will follow. After recently moving, I had to switch my internet/cable/telephone provider to Xfinity (Comcast) because my old company didn’t service my new area. Now, if you do a quick google search on the companies with the worst customer service, Comcast consistently ranks at the tops of those lists. Much to my dismay, my choices were very limited (like so limited Comcast was the only provider) and I was forced to go with a company I didn’t want to support because internet and television are major necessities in my household. They did happen to include Netflix access directly on their cable box and gave me a voice-operated remote control, so I’ll let the terrible customer service slide for the time being. If you didn’t know, Comcast is probably the king of global telecommunications conglomerates. The amount of assets they own is seems to be never ending. They recently came out with a mobile phone plan that I’m considering purchasing, just because it’s cheaper and more convenient to have all my bills under one roof. That’s one of the clear advantages of media convergence – convenience. With Comcast, I can stream This Is Us (favorite NBC show) on my iPad through the Comcast cable app using Comcast’s wifi and then call my best friend using my Comcast powered wireless phone to recap the episode and talk about how many times I cried. 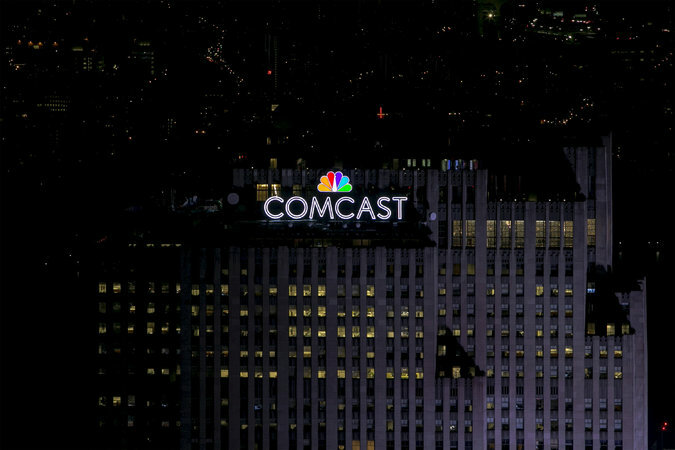 Comcast really epitomizes both roles of media convergence – they have made media channels like television and telephone available on a singular platform like an iPad, and they participate in a cross platform business model by consolidating so many media holdings under one name. When it came to finding a fake news source for this blog post, I had absolutely no problems because I already know the queen of fake news – a family member near and dear to my heart. I’ve tried, on multiple occasions, explaining to her that these Facebook “news sources” she gets her news from are not trustworthy. But, because her best friend also likes and shares these articles, she won’t hear me out. I’ve learned to pick and choose my battles. Did I just make that headline up? Or was it really published? The fact you even have to assess whether this headline is real or fake shows there is a problem. When I first read this headline, I actually considered whether it could be true. To be fair, I have zero background when it comes to the weight capacities of horses. It does have a clickbaity ring to it, but it also literally has [VIDEO] written in the headline, so does that mean there’s a video of DJ Khaled breaking a horse’s back? Spoiler Alert: No, DJ Khaled not break any horse’s back. He did go horseback riding on his recent vacation to the Bahamas and shared a video montage of his horseback riding adventure, but that horse is alive and well. Thank God for Snopes, am I right? Even though fake news isn’t a new concept, the rise of social media is changing the way we digest our news, making it more difficult to discern which headlines are 100% truthful. There’s an unprecedented amount of media being thrown at us every single day, whether it’s through our Facebook and Twitter feeds or during our favorite radio show we listen to on our morning commute. Fortunately, big internet companies like Facebook are taking action by banning and filtering fake news, but fake headlines will still fall through the cracks – this is why being media literate is so important. We, as daily consumers of media, can slow the momentum of fake news by (a) thinking critically about what messages are true and (b) not sharing said messages and flagging them as fake news. How can you practice media literacy? Be skeptical and consider your sources. If a headline sounds like breaking news that is too good (or bad) to be true, then it probably is. If you’re still really unsure if it’s fake news, resist the urge to click through and google it on your own. In order to develop an informed understanding of the media messages we encounter, we have to be critical of their motives. Although the Shakeweight infomercial tells me I won’t be able to live without it, I can critically assess that’s not true and they probably just want my money. By practicing media literacy, we’re not only combatting the spread of fake news, but also challenging the the way media impacts our thoughts and decisions. In the end, we’re left with less manipulation and better perspective on the things surrounding us in our day-to-day lives.